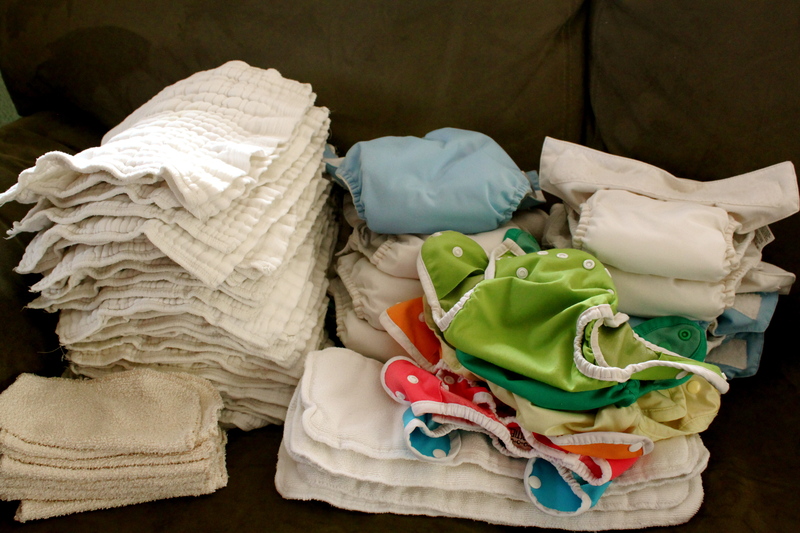 I have been cloth diapering since Beckett was a wee one and thought I had things figured out. I have found the diapers I like, my local source for everything cloth diaper, the detergent that works for our washer and hard water and the methods for stain treating that I rely on. But, I was catching up on my reader a few weeks ago and ran across the term “stripping” for cloth diapers. My reaction was “huh?”. The blogger was struggling with a diaper rash that wouldn’t go away and a yellow dinginess that lingered on the clean diapers. She finally resolved this by stripping the diapers – the first time she’d done so after using the same diapers for four children. The only problem I noted with the blog was that she had a top loader washing machine. I have a beautifully shiny, oh-so-wonderful front loader that holds umpteen pieces of clothing, works miracles with stains and is blissfully quiet in a very raucous house. But, it’s not always the right machine for the job. The first time I learned this was when I attempted to wet felt a knitted project. Long story short – it took FOR.EV.ER. And, apparently stripping cloth diapers is another ill fit for a front loader. Cloth diapers have a wonderful quality, extreme absorbency, that is also a double edged sword. For all the waste they absorb, they also take on the detergents that are used for regular washings. Yes, this happens with even the super safe cloth diaper detergents, extra rinses and clothesline drying us veterans practice. The basic premise of stripping is to rinse, not wash, all of the detergent residue out of the diapers. Synthetic materials, like microfiber, tend to require stripping more often than natural fabrics, like cotton and hemp. Stripping in a top loader is easy – just rinse the diapers until there are absolutely no bubbles in the water. This may take up to a dozen rinse cycles to get the diapers completely stripped. Front loaders are eco-friendly because they use very little water in comparison to top loaders and have the ability to adjust the amount of water required based on the volume of clothes. The problem is that because of this feature, you are unable to get sufficient water volume to truly soak and rinse the diapers in a pool of water. My machine doesn’t have a manual water level setting, but if your machine does, you may be able to alter the water level to a certain extent. Get the diapers soaking and rinsing in A LOT of water. Option 1: Use a top loader. If you are doing this, just go ahead and keep using the top loader. Option 2: For those of who don’t have access to a top loader and don’t want to cart a gazillion diapers to the laundromat and drop a chunk of change in the machine – this option works awesome. Fill up your bathtub (clean bathtub, mind you) with cold water and cover the diapers with at least a few inches of water. Use your hands to slosh the diapers around. My three-year-old LOVED this job and thought it was a blast to have diapers in the bathtub. Look for bubbles in the water. If there are any – drain the tub and do this at least a few more times. Once the majority of the bubbles are gone, enlist some strong arms and load the diapers up. Take them to your front loader and utilize your rinse cycle until the diapers are sufficiently rinsed. How do you know when this is? You don’t really. I picked a number of rinses and did that – mine “number” was eight rinses. Dry the diapers as you normally would. Stripping our cloth diapers was so worth the effort. They came out of the process looking fresh and bright and there hasn’t been a single stubborn diaper rash. It would have been a bit easier in the a top load washing machine, but it’s worth the effort and diligence to rinse them thoroughly. My plan is to strip the diapers every twelve to eighteen months. This entry was posted in home & hearth, nice & natural, waste not, want not. Bookmark the permalink. I’m going to put a link to this post on my Cloth Diapers 101’s page, hope you don’t mind. People are always wondering about stripping (me included). Go ahead! 🙂 I welcome links. I hope that people find this one helpful. Do you use any product like rlr or blue dawn soap for stripping or is is just the cold water? I have used RLR in just the washer to scrub it clean and flush it out. Our front loader has a “clean washer” cycle and I use the RLR with that. I alternate the blue dawn soap for every other stripping. When I did my first major stripping I used it, too. Let me know if you have any other questions. Hi! Thank you for your post! Just to clarify: You do not use RLR or Dawn to strip the diapers themselves and use these only on the washing machine? Is your diaper stripping really strictly rinsing? Thanks for letting me know that you enjoyed the article. The RLR is a real quick “stripping” but doesn’t really count as a true stripping of the diapers. The Dawn soap is important to stripping because it agitates and “washes” the diapers of their remaining/residue laundry detergent. You could just do a rinse over and over, but the use of Dawn along with a LOT of rinsing will ensure that the diapers are truly stripped. Does that make sense? I know this is an old post, but I had to ask. How long do you recommend soaking the diapers before the actual washing cycle begins? I’m not exactly sure what the purpose for the soak is, which is why I’m asking. Thank you, I really hope you are still checking this blog for comments.